Seminyak, Bali – 23 January 2014; Maca Villas & Spa Bali today announced that it has been named as TRIPADVISOR TRAVELLERS’ CHOICE winner in the Top Luxury Hotels, Top Hotels for Romance, Top Small Hotels category in the 2014 Travelers’ Choice® awards. In the 12th year of the awards, the world’s most outstanding properties were identified in the categories of Top Hotels, Bargain, B&Bs and Inns, Family, Luxury, Romance, and Small Hotels. Yoga Iswara, General Manager, Maca Villas & Spa Bali quotes, “It was truly an honor for us to receive the Award, our dedication and commitment to Service Excellence brought these Prestigious Awards to Maca Villas & Spa Bali.Being awarded as Travelers’ Choice Winner 2014 in the categories of Top Luxury, Top Romance and Top Small hotel indicates to us that we are on the right track to achieve our mission to be recognized as the preferred villas destination in Bali. These awards are testaments to our Team efforts to consistently deliver their best and encourage them to continue provide Service Excellence as our standard everyday for every guest. 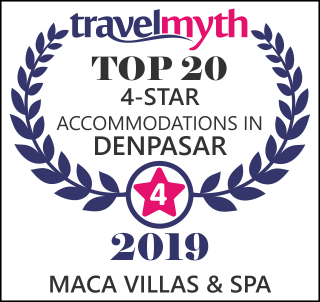 We would like to thank our guests who have played a major roles in making this possible and assure them that every action and decision made at Maca is based on consumer satisfaction, hopefully you will continue to support us till the years to come and make Maca Villas & Spa Bali your “home away from home” every time your travels bring you to our great island”. For Maca Villas & Spa Bali’s reviews, please visit TripAdvisor pages of Maca Villas and Spa Bali . To see all 2014 Travelers’ Choice winners, please visit www.tripadvisor.co.uk/TravelersChoice. About Tripadvisor: TripAdvisor® is the world's largest travel site*, enabling travellers to plan and have the perfect trip. TripAdvisor offers advice from travellers and a wide variety of tra vel choices and planning features with seamless links to booking tools. TripAdvisor branded sites make up the largest travel community in the world, with more than 260 million unique monthly visitors**, and more than 125 million reviews and opinions coveri ng more than 3.1 million accommodations, restaurants and attractions. The sites operate in 34 countries worldwide, including China under daodao.com. TripAdvisor also includes TripAdvisor for Business, a dedicated division that provides the tourism industry access to millions of monthly TripAdvisor visitors. The tranquil setting of Maca Villas & Spa Bali is just minutes away from the beach and the myriad of fine dining – restaurants, boutique shops and nightlife venues that has made Seminyak world famous. From check-in at the open-air reception-lounge – a modern twist on traditional Balinese design – a warm welcome ensues from the MACA staff, with round-the-clock guest concierge and villa butler service providing a personal touch. Set amongst lush tropical landscaping and the shooting of running water, twenty-five 1 and 2 bedroom pool villas are intimately designed for total privacy and capture the true essence of a Bali Holidays. Spacious living rooms with an abundance of natural light open on to wooden pool decks with sun loungers. Deluxe villas have covered day beds floating over their pools, ideal for idling the hours away. Maca villas’ beautifully designed bedrooms all have king size beds and luxuries en-suite bathrooms. Each villas is equipped with LCD flat screen TV’s digital entertainment system with music and movies, cable TV, i-Pod docking station and wireless internet. Time is all yours own at Maca Villas & Spa. Spend your day by the main pool while enjoy our facilities and services such as spa centre, yoga class, chakra therapy, Masé Kitchen & Wine Bar for wide array of wine with competitive price, and Ippolito specialty coffee for the best coffee in town.